The Pra Somdej Prok Po Hlang Yant Roop Muean Luang Phu Phueak 2514 BE amulet, is an Eternal Classic and Highly Sacred Amulet, which was made in 2514 BE, bythe 'Sit Aek' first apprentice of Luang Phu Phueak; Luang Por Ajarn Sukh of Wat Ging Gaew, using the Muan Sarn Sacred Powders of his Kroo Ba Ajarn, the Great Luang Phu Phueak. The amulet is an immensely sought after by the devotees of Wat Ging Gaew, and by the Devotees of other temples, for the fact this series was not only Blessed by Luang Por Sukh at Wat Ging Gaew, but also, was Blessed in Buddha Abhiseka by the Great Luang Phu To (Wat Pradoo Chimplee), Luang Por Te (Wat Sam Ngam), and Luang Por Ngern (Wat Don Yai Horm), as well as a l;arge number of other Great Guru Monks of the time. 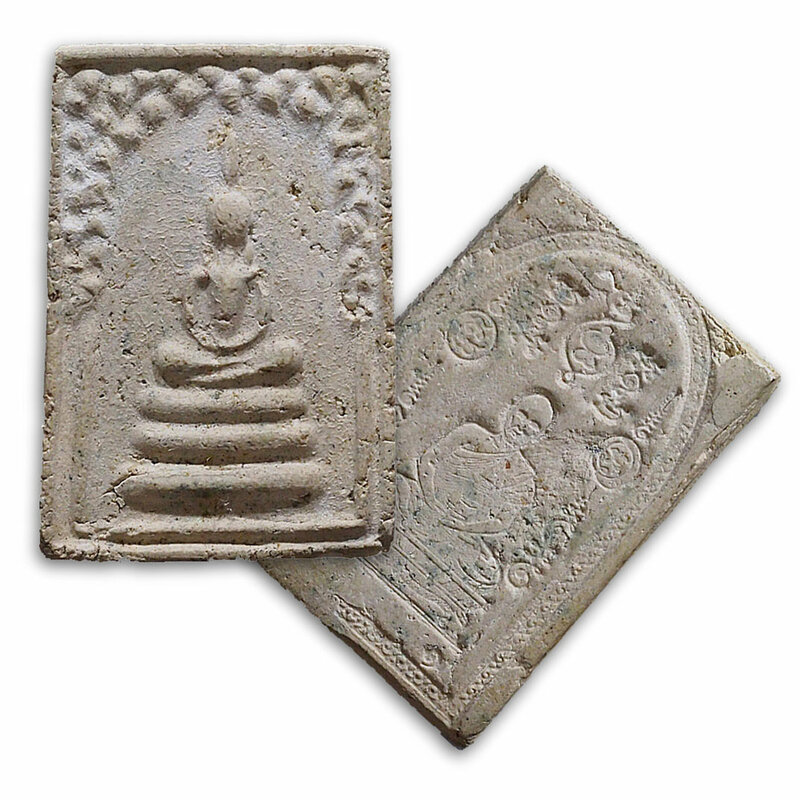 The Pra Somdej Prok Po Hlang Yant Roop Muean is a perfect and accepted reference study material for students of the Dtamra Pra Somdej, and for study of the Muan Sarn Sacred Powders used in the amulets of Luang Phu Phueak. Viewing the Muan Sarn Sacred Powders of the surface texture of the amulet closely reveals its true character and distinguished class through the surface features. 'Phiw Haeng Dtam Ayu' (surface features reveal obvious age), 'Roi Dtua Hnon' (stippled surface effect like maggot trails). Luang Por Sukh was born in the year 2457 BE. He was the first and longest standing apprentice to Magic under Luang Phu Phueak, having been ingressed in the temple by his parents for his education at the age of 8 years old, and studied uder Luang Phu Phueak from then onwards. He was a lifetime student who ordained at Wat Ging Gaew at the aged of 20 with Luang Phu Phueak as his Upachaya Ordaining Officer. Luang Por Ajarn Sukh also went by boat to practice Wicha with the great Luang Por Tong of Wat Rach Ayotaya, who was one of the aged Masters of the preceding generation of Great Sorceror-Monks. Luang Por Sukh at first only thought he might be lucky enough to gain the Wicha Takrut of Luang Por Tong Wat Rach Ayotaya, but he became very beloved by Luang Por Tong, and ended up visiting regularly to receive his complete compendium of magic spells and amulet making methods. Luang Por Sukh (sometimes also called 'Tong Sukh), then disrobed for a while, but soon became dispassionate with the lay life, and reordained 2 years after his Kroo Ba Ajarn Luang Phu Phueak passed away, in the year 2503 BE. After he was ordained, the GFreat Luang Phu Bun Mee requested that Luang Por Sukh helped him to be the abbot for a while, and build an Uposatha Shrineroom at Wat Ban Chaloeng. Luang Por Sukh accepted this challenge and completed it within a few years, asfter which he returned to Wat Ging Gaew to seek his solitude and his usual practice of remaining out of the limelight. Luang Phu Phueak was a Gaeji Ajarn of the Samut Prakarn Province, and one of the great and Highly Famed Masters of the Pre 2500 BE Era, who was both Nationally and Internationally famous, for his Patipata and Magic Powers, and for his Amulets. He graced some of History's most famous Buddha Abhiseka Blessing Ceremonies of national Importance, invited for his great prowess in empowering amulets, especially the great ceremonies held at Wat Rachabopit, and Wat Sutat.Luang Phu Phueak was born in the locality of Samrong in Bang Pli, samut Prakarn (now a municipality of Bangkok) on 12th August 2412. His father was called Mr. Tong Sukh, and his mother was known as Miss Khai, with the surname of Sukh Tong. He was the 5th child of the family with four Siblings. His family were farmers. In his younger yearshe helped his family with the household and farming duties until he reached the age of 13, when his parents took him to receive his schooling with Pra Ajarn Im Intasaro, the abbot of Wat Chang Hnong Ging Mai (Wat Ging Gaew). In olden days, the temple was where most children got their chance of an education, and would be taught about moral conduct from monks. as the young Phueak reached the age of 15, he was able to read and write, and returned to help his family out with their daily work on the farm. At the age of 18, he was called in to National Service in the Military to serve in the Navy and did his 2 years service. In the year 2433 at the age of 21, Luang Phu Phueak was ordained according to Thai Cultural Tradition as a Bhikkhu, in front of the Putta Sima Temple Boundary at Wat Ging Gaew with Luang Phu Tong of Wat Rachayotya as his Upachaya Ordaining Officerm and Pra Ajarn Im of Wat Ging Gaew as his as his Pra Gammawājājārn (Promoter). He was given the ordained name of 'Banyātarō'. After he was ordained, Luang Phu Phueak remaimed resident at Wat Ging Gaew, under Pra Ajarn Im, and gave extreme efforts and diligence in studying the Dhamma Vinaya, Pali Sanskrit and Khom Agkhara Sacred Scripts. He quickly became proficient in all of these Wicha and was dearly beloved by all of his teachers and Kroo Ba Ajarn. Once he had mastered these subjects, Luang Phu Phueak turned to focus himself on the practice of Vipassana Kammathana Mindfulness Insight Meditation, and fulfilled all the greatest expectations of Pra Ajarn Im, in his advancements. Pra Ajarn Im began to administer important duties of the temple to Luang Phu Phueak with full trust. Then, in the year 2442 BE, Pra Ajarn Im passed away, and in this moment, the devotees of Wat Ging Gaew wrote letters to the Sangha Committee to beseech them to elect Luang Phu Phueak to become the new Abbot. Luang Phu Phueak was first given the duty of taking care of the temple until a new abbot was elected, and immediately began to restore and build up the facilities of the temple in a grand fashion. At first, he did this with very little assistance of the locals, but as his efforts and attainments slowly began to become visible, and the devotees of Wat Ging Gaew began to flock to assist in ever increasing waves. The devotees became so impressed and instilled with faith in the diligent selfless work of Luang Phu Phueak, in restorations, and temple developments. Luang Phu Phueak built an incredible number of Thavarawadtu (Buddhist Shrines, statue images and amulets), including the Uposadha Shrienroom at Wat Ging Gaew, the 5 Meter wide Buddha Chinarat Jamlong statue, the Sala Bprian Montop, The Pariyatti Dhamma School, which he built for the children of local folk to have an education. Luang Phu Phueak was officially elected Abbot of Wat Ging Gaew in the year 2442 BE at the age of 35 in his 13th year of ordination and in 2443 was elected Bishop of Racha Taewa Municipality, and also further elected to become the Arch-Bishop of of Samut Prakarn. In addition he was also elected to status of Upachaya monk. In the year 2480 BE, at the age of 77, in his 59th year of ordination, Luang Phu Phueak was given the honorary status name of Pra Kroo Garuna Wihari. In the year 2487 BE, Luang Phu Phueak became the Head of the Sangha Comittee of Bang Pli. In the year 2487 BE, Luang Phu Phueak began to weaken and become ill through his old age suffering from bladder ailments and was ingressed into the Rong Payaban Songk Sangha Hospital, where he was discovered to have Cancer. He was operated and began to recover, and later returned to the temple after 7 months, and began to work again at his usual duties. He would receive and listen to the problems of the local devotees every day, and give his full efforts to help them. Luang Phu Phueak lived on a further 5 years after his operation, until in the year 2501 BE on the 29th day of the month of March, Luang Phu Phueak passed away at the age of 89 years old, after 69 Years of Ordained life.